An intimate world-class retreat, Rosewood Inn of the Anasazi celebrates the enduring creative spirit and traditions of the region’s early Native Americans, the city’s rich cultural heritage as an early Spanish establishment and its ongoing legacy as an artist colony. The name and interiors of this Santa Fe boutique hotel pay homage to the area’s native Anasazi tribe, while the handcrafted textiles, paintings, carvings and baskets that make up the hotel’s extensive art collection are a vivid blend of Native, Hispanic and Anglo influences. 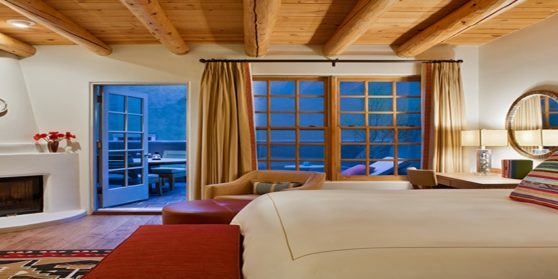 With the city’s historic plaza just steps from the hotel doors, and popular destinations like Canyon Road, Taos and Bandelier National Park within driving distance, this sterling example of Santa Fe luxury hotels offers guests an experience that is uniquely New Mexican.